Available Bar Sizes: 12" 18" 24" 32"
The full-spray, push button hand held shower head, offers the versatility of a hand shower and the conveniences of a fixed shower head. Unit includes a full-spray hand held shower with push button pause control to slow water flow to a trickle to help you soap up. The hand held shower also features rub clean nozzles; simply rub your fingers over them to remove mineral build-up. Comes with a durable flexible, 6-foot stainless steel hose that is perfect for added reach when rinsing in the tub or shower, cleaning pets or shaving. The shower arm mount allows for hands free showering. Also includes the side bar mount to adjust for any angle and height you might want. 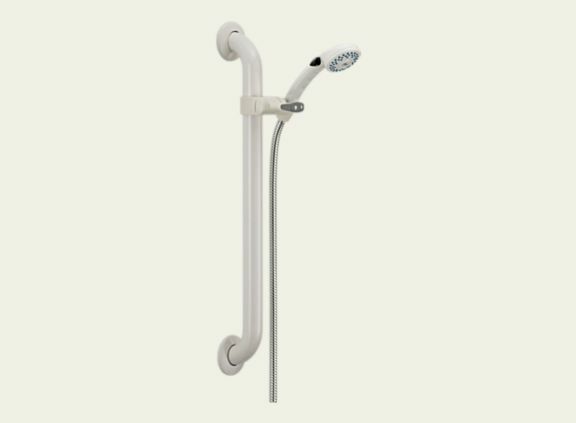 The Adjustable Slide Bar + Shower Head is sure to bring showering pleasure for many years to come.